Reclaimed slate is ideal for adding a little extra character to any property. Beautiful and cost effective, second hand roof slates are a fantastic roofing material. To find out more about these stunning slates make sure to take a look at the individual product pages listed above. Our slates come in a range of sizes, from 16×8 through to 24×14. We also offer a bespoke service, and can cut the slate to suit your individual requirements. Whatever project you’re planning, we’re sure to be able to provide the materials you need. Second hand roof slates are an ideal option for restoring the character of period properties and will give your home a more authentic appearance. Our reclaimed slate tiles are an excellent roofing solution too; highly durable, water proof, and naturally beautiful, they make a fantastic addition to any roof. Not only is reclaimed slate beautiful and durable by nature, it’s also one of the most environmentally-friendly roofing materials around. 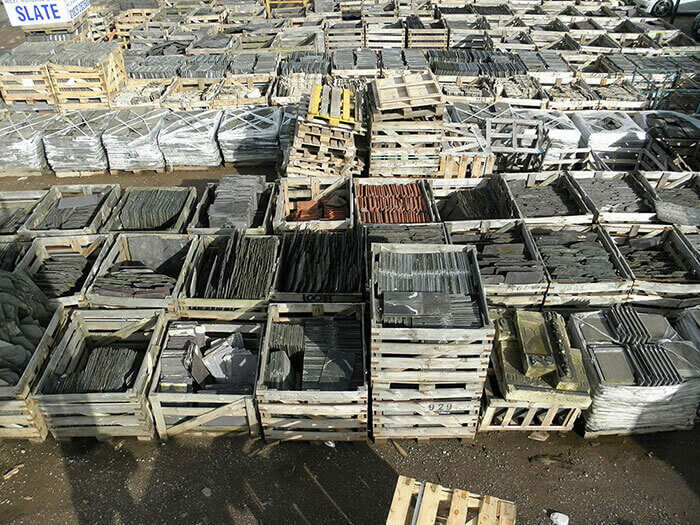 All our reclaimed slates are responsibly sourced from a variety of different locations, so if you’re looking for greener building materials there really is no better choice. At All Slates we pride ourselves on offering all our customers the best possible service. If you can’t get to our yard, then we can provide a delivery service throughout the UK. To find out more about our reclaimed slates, or any of our other products, contact us today to speak to a member of our expert team.